de Havilland Vampire Mk.1 Development of a jet fighter later to be named the Vampire began in 1941 and related closely with the development of the H-1 jet engine, for which the engine section of de Havilland company was responsible. The engine was later to be known under its new name Goblin and its development turned out to be very successful. The Vampire was therefore ordered under Air Ministry specification E.6/41 calling for an experimental machine able to be converted to a fighter plane. The design of the plane was fully adjusted to the new engine, which resulted in overall tiny dimensions of the plane, very low undercarriage and the tail planes being carried by two slim tail booms. Unlike the later marks of the aircraft, the plane’s wing featured rounded tips. The first prototype, unofficially named the Spider Crab, flew for the first time on September 20, 1943 with G. de Havilland Jr at the controls. The trials were a success and an order for first 120 planes was placed in May 1944 and was continuously increased. The production planes were also licence-built by English Electric because de Havilland was much too busy producing the Mosquito. The original name Spider Crab, however, was rejected by the RAF and changed to the Vampire Mk.I. First operational squadrons got their Vampires in May 1945, but not early enough to take part in the war. The development continued with further versions, besides those with the DH Goblin engine, there were also versions with the Nene powerplant (airfames built in Australia), two-seat night fighter versions, two-seater training versions or even naval fighter versions (Special Hobby produce the Mk.3 Vampire, model #SH72279 and the Mk.5 Armée de l'Air & Aéronavale, #A117). 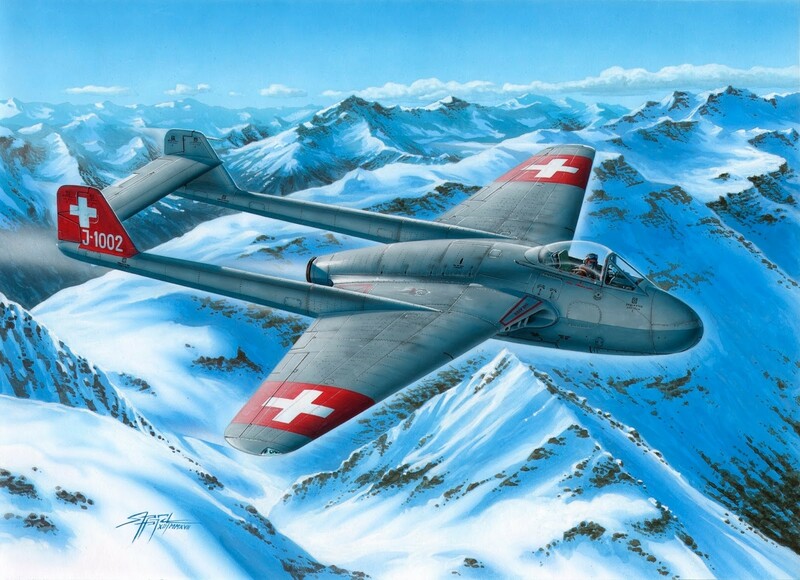 The Vampire Mk.I also became the first jet aircraft to be used by two neutral countries, Sweden and Switzerland. Our model kit brings in total four marking options of these two neutral countries. 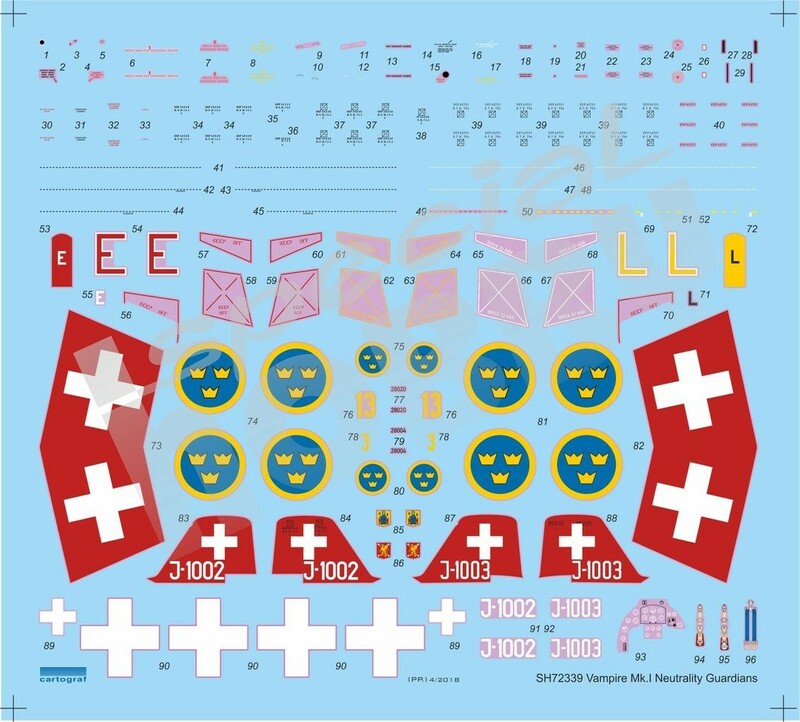 Two of the featured airframes bear colours of the Swiss Flugwaffe, white crosses on red background. Machine J-1002 flew in Medium Sea Grey over PRU Blue whilst machine J-1003 was silver dope overall. 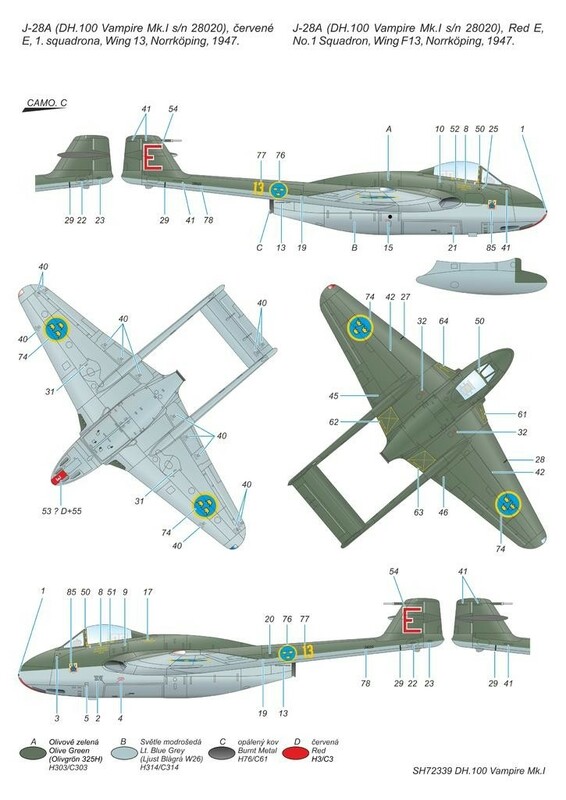 In Sweden, the Vampire was known as the J-28A and got green camouflage above and grey below. The two Swedish machines were used by different units, the first options carries Red E tail code of No.1 squadron / Wing F13, the other has Yellow L of No.3 Sqn/Wing F3. The model comes on three sprues of grey injection styrene and one frame of clear canopy and wingtip parts.